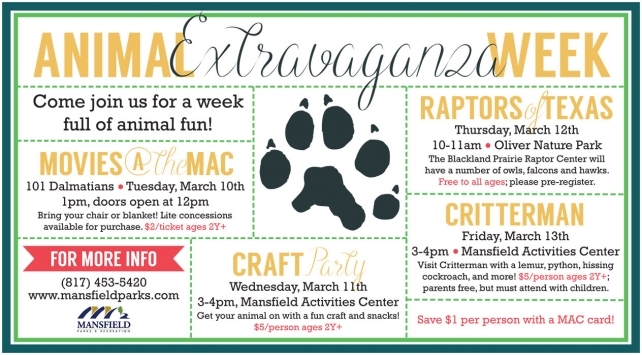 Come join us in Mansfield for a full week of animal fun! 101 Dalmations Movie at the MAC at 1pm. Doors open at 12pm. Bring your chair or blanket. Light concessions available for purchase. $2/ticket above 2 years old. Craft Party from 3-4pm at the Mansfield Activities Center. Get your animal crafting on! Raptors of Texas at Oliver Nature Park from 10-11AM. The Blackland Prairie Raptor Center will have a number of owls, falcons and hawks. Free to all ages; please pre-register. 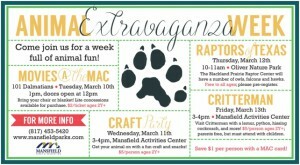 Critterman at the Mansfield Activities Center from 3-4pm. Visit Critterman with lemur, python, hissing cockroach and more! $5/person 2 years and up. For more information call 817-453-5420 or visit www.mansfieldparks.com. This entry was posted on Monday, February 9th, 2015 at 12:17 pm	and is filed under Events, News & Updates. You can follow any responses to this entry through the RSS 2.0 feed. Both comments and pings are currently closed.